Mick Fanning and the unexpected candygram. Professional surfer Mick Fanning is currently locked in a tough battle with fellow Australian Julian Wilson. The two rivals sit atop the World Surf League standings, competing for the world championship and all the prize money that comes with winning the sport’s top prize. However, at the J-Bay Open in Jeffreys Bay, South Africa, the battle with human competition suddenly became meaningless for three-time world champion Fanning. Instead, the battle for survival took precedent. 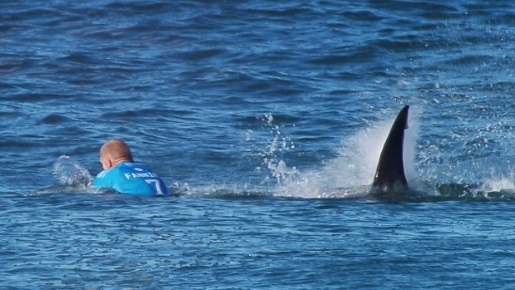 Mick Fanning was attacked by a great white shark on live television during a surfing event. Here’s the video as it happened. Indeed, Fanning and Wilson will not be finishing their battle at the J-Bay open; instead, the two surfers will skip the final round and will instead split the championship purse. Jeffreys Fay is one of the world’s best surfing spots, as well as one of the world’s busiest shark attack areas. Those two things tend to go hand-in-hand for whatever reason. Either way, the battle for the top surfing spot continues with both surfers emerging from the water uninjured.